Here are my quick notes from the BruCO N 2018 conference.This first day was called “Retro Day” because it contained the best (as chosen by peoples) previous talks. All the slides of the conference can be found here. Wifi devices assume that each device is behaving fairy,share the bandwidth with the other devices for example. selective jamming; block specific packets. SIFS : represents the time to let the hardware process the frame. Backoff : random amount of time, used to avoid collisions. What if are multiple selfish stations ? bit-rate is decoded (similar to FM radio). We can jam any device that use the 2.4 and 5 GHz band, not only wifi, but other devices like security cameras. detect and decode the header. The hard part is the first step. This is done by monitoring the (RAM) memory written by the radio chip. Breaking WPA2; this is a shorter version of :KRACKing WPA2 in Practice Using Key Reinstallation Attacks. RQ-3 DarkStar – self flying drone; it crashed due to cracks into the runway. sandstorm ; self driving car contest: in this case the mismatch between GPS info and other sensor. extremely difficult to interfere with acoustic attacks. gyroscope vibrates and has a resonance frequency. introduced the idea of security champion. introduced the RFC (Review For Commens) document = Technical Design. becomes a standards through adoption. introduction of bug bounty program. security team had doubled in size. sec-ops team and read team are working together. detected an api key from AWS in a commit. remove the usage of long-lived AWS Api keys. Definition: efforts to influence popular attitudes and social behavior. Main take away (for 2018); the social engineering (a.k.a SE) is used more and more and actually the techniques it didn’t change too much. what has changed since 2009 ? the scale of the attacks. ethical SE is mostly phishing. peoples do not like confrontations. The presentation was about pen test bad examples and how to make the things better. Accidentally pasting other customer names. 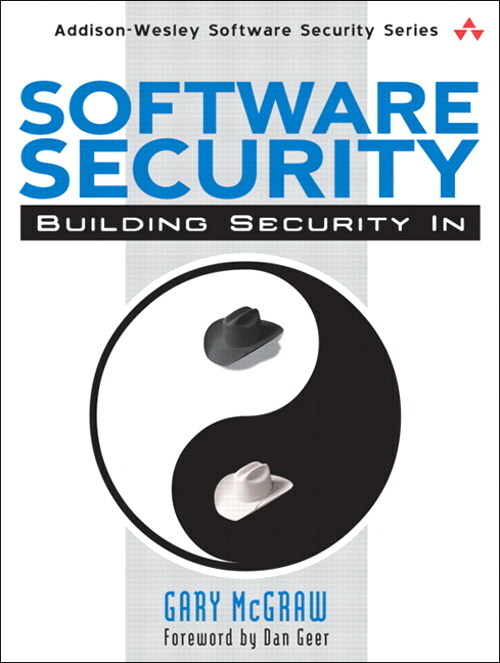 This is a review of the second part of the Software Security: Building Security in book. This is an introductory chapter for the second part of the book. A very brief description is made for every security touch point. Code Review (Tools). Artifact: code. Constructive activity. Architectural Risk Analysis. Artifact: design and specification. Constructive activity. Abuse Cases. Artifact: requirements and use cases. Predominant destructive activity. Security Requirements. Artifact: requirements. Constructive activity. Security Operations. Artifact: fielded system. Constructive activity. Another idea to mention that is worth mentioning is that the author propose to add the securty aspects as soon as possible in the software development cycle;moving left as much as possible (see the next figure that pictures the applicability of the touchpoints in the development cycle); for example it’s much better to integrate security in the requirements or architecture and design (using the risk analysis and abuse cases touchpoints) rather than waiting for the penetration testing to find the problems. For the author the code review is essential in finding security problems early in the process. The tools (the static analysis tools) can help the user to make a better job, but the user should also try to understand the output from the tool; it’s very important to not just expect that the tool will find all the security problems with no further analysis. In the chapter a few tools (commercial or not) are named, like CQual, xg++, BOON, RATS, Fortify (which have his own paragraph) but the most important part is the list of key characteristics that a good analysis tool should have and some of the characteristics to avoid. Around 50% of the security problems are the result of design flows, so performing an architecture risk analysis at design level is an important part of a solid software security program. In the beginning of the chapter the author present very briefly some existing security risk analysis methodologies: STRIDE (Microsoft), OCTAVE (Operational Critical Threat, Asset and Vulnerability Evaluation), COBIT (Control Objectives for Information and Related Technologies). Two things are very important for the author; the ara (architectural risk analysis) must be integrated in and with the Risk Management Framework (presented briefly in Book review: Software Security: Building Security in – Part I: Software Security Fundamentals), and we must have a “forest-level” view of the system. attack resistance analysis – have as goal to define how the system should behave against known attacks. ambiguity analysis – have as goal to discover new types of attacks or risks, so it relies heavily on the experience of the persons performing the analysis. weakness analysis – have as goal to understand end asses the impact of external software dependencies. The chapter starts by presenting how the penetration testing is done today. For the author, the penetration tests are misused and are used as a “feel-good exercise in pretend security”. The main problem is that the penetration tests results cannot guarantee that the system is secured after all the found vulnerabilities had been fixed and the findings are treated as a final list of issues to be fixed. So, for the author the penetration tests are best suited to probing (live like) configuration problems and other environmental factors that deeply impact software security. Another idea is to use the architectural risk analysis as a driver for the penetration tests (the risk analysis could point to more weak part(s) of the system, or can give some attack angles). Another idea, is to treat the findings as a representative sample of faults in the system and all the findings should be incorporated back into the development cycle. Security testing should start as the feature or component/unit level and (as the penetration testing) should use the items from the architectural risk analysis to identify risks. Also the security testing should continue at system level and should be directed at properties of the integrated software system. Basically all the tests types that exist today (unit tests, integration tests) should also have a security component and a security mindset applied. functional security testing: testing security mechanism to ensure that their functionality is properly implemented (kind of white hat philosophy). adversarial security testing: tests that are simulating the attacker’s approach (kind of black hat philosophy). For the author the penetration tests represents a outside->in type of approach, the security testing represents an inside->out approach focusing on the software products “guts”. 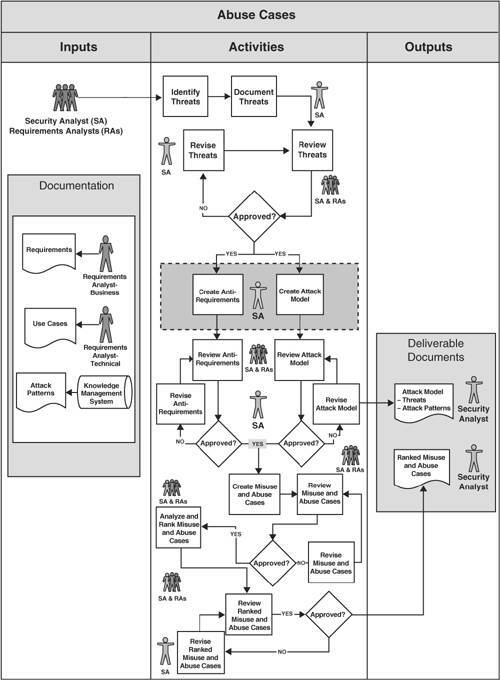 The abuse case development is done in the requirements phase and it is intimately linked to the requirements and use cases. The basic idea is that as we define requirements that suppose to express how the system should behave under a correct usage, we should also define how the system should behave if it’s abused. This is the process that is proposed by the author to build abuse cases. The abuse cases are creating using two sources, the anti-requirements (things that you don’t want your software to do) and attack models, which are known attacks or attack types that can apply to your system. Once they are done, the abuse cases can be used as entry point for security testing and especially for the architectural risk analysis. The main idea is that the security operations peoples and software developers should work together and each category can (and should) learn from the other (category). The security operation peoples have the security mindset and can use this mindset and their experience in some of the touchpoints presented previously; mainly abuse cased, security testing, architectural risk analysis and penetration testing. This is a review of The Basics of Web Hacking: Tools and Techniques to Attack the Web. The chapter starts with a quick introduction to some fundamental notions of web development like web applications, web servers, http protocol and a quick presentation of 2 penetration testing methodologies: The Open-Source Security Testing MethodologyManual (OSSTM) and Penetration Testing Execution Standard (PTES). The last part of the chapter is dedicated to the creation of the testing environment. As testing environment the author uses the BackTrack 5 distribution on which Damn Vulnerable Web Application (DVWA) is installed. The installation procedure is slightly outdated, for a newer version you can check this blog entry. This chapter is dedicated to the hacking of the first type of target: the web server; the chapter is constructed arround the 3 steps (actually 4, but the Fix step have a dedicated chapter) that should be follow in order to sucesfully attack a web server. The reconnaissance step is made firsly manually using commands like host and analysis of the robots.txt file. Once some basic data about the web server is gathered, the automatic step of the reconnaissance is fulfilled using the Nmap port scanner. The authors explains how the Nmap can be updated (in case your BackTrack distribution do not have the version 6 or later) and some basic scan commands are performed (some of the flags used by the nmap command like -O, -sV, -p are explained in detail). The scanning step is fulfilled using the Nessus tool. For Nessus, the authors explains how to install the free version, configure, run a basic scan and interpret the results. The Nikto open-source scanning tool is also very briefly presented. The chapter is dedicated to the web application reconnaissance and scanning. The recon part have as goal to build a map of the target web site using a web proxy. A web proxy is a application that stands between the client browser and the web application and intercepts the . The recon part can be done using automated spidering (the application starts from a page and automatically finds and requests links, submits forms, and performs any allowed action) and a manual spidering (the human operator browse through the web site). The recon is handled using the Burp Suite. The scanning part have as goal to discover vulnerabilities. A web proxy is capable to find vulnerabilities that are detectable by inspecting the clients requests and server responses like input-based vulnerabilities targeting the server side of the application (SQL injection, OS command injection and path traversal) or input-based vulnerabilities that target the client side (XSS). The scanning part is handled using the OWASP Zed Attack Proxy (ZAP) and the author also presents briefly the Burp Scanner which is only available in the pro version of Burp Suite. This chapter is mainly dedicated to the SQL injection vulnerabilities and Operating System Command vulnerabilities. For the SQL injection the author explains in great detail what is the SQL and how this class of vulnerabilities can affect the target web application. To find and expose this kind of vulnerabilities the author uses the Burp Proxy, Burp Repeater and the sqlmap tool (which is a SQL injection command line tool). The second part of the chapter is dedicated to the Operating System Command vulnerabilities. These types of vulnerabilities are covered in less detail compared to the SQL injection. In order to demonstrate these types of vulnerabilities the DVWA application is used but no tools that are capable to find (or to help the user to find) this kind of vulnerabilities are presented. One interesting detail for this chapter is this page containing one-liner reverse shells. The author tries to broke the (web application) authentication using 2 methods: a brute force attack and an attack on the cookies generated by the web application. For the brute force attack, a normal authentication attemp is initially intercepted using Burp Intercept in order to find the parameters (username name and password) used for the authentication. Once this parameters have been found, the Burp Intruder product is configured to execute (repetitively) the authentication with different usernames and passwords; these usernames and passwords (called payloads) are read from external files. The attack on the cookies it’ around the randomness of the session identifiers and the test it’s done using the Burp Sequencer product. The last part of the chapter is dedicated to the path traversal attacks. The theorethical part of this kind of attacks is very good covered but (as for the OS command vulnerabilities) no tool that can discover this kind of vulnerbilities is presented. This chapter is a (very) light introduction to the Cross-Site Scripting (XSS) vulnerabilities, Cross-Site Request Forgery (CSRF) vulnerabilities and to the social engineering vulnerabilities. The good part about this chapter is that the author gives very good explanations about how this kind of attacks are triggered by the bad guys: it gives very good explanation about the difference between the XSS and CSRF vulnerabilities, it explains what is the different between a reflected and a stored XSS attack, it also gives good (web sites) references http://XSSed.org , OWASP XSS Filter Evasion Cheat Sheet , http://www.social- engineer.org/). On the less good part, the author do not explains how the attacker can exploit the info gathered from an XSS attack (he just says that the attacker can retrieve the user cookie using a Java script call like document.cookie). This chapter is about how to fix the vulnerabilities presented in the previous chapters. The chapter is articulated around the same 3 possible targets: web server, web application and the web user. For the web server, the author proposes some strategies for server hardening: develop a repeatable hardening process, develop a process for deploying all new software updates and patches in a timely manner to the live systems, running scans and doing audits. For the web application and the web user, the author proposes some sort of “to do” list for almost every kind of vulnerability (for example for the “Injection vulnerabilities” here is the list of things to do: Use parameterized queries, Escape malicious syntax, Make use of stored procedures, Remove unnecessary functionality on your database server, Encrypt sensitive dat). This small chapter contains some ideas in order to extend your knowledge regarding the security topics; what are the security grouse and events, what are the existing (security)certifications and some titles of security books. If you have no prior knowledge, this is very good introductory book in the web security topics; the writing style is clear and easy to follow.